In the mountains, in the zone, my zone. It's the high season in the Rockies; who ever would have thought that I could love summer? Savory sweet, bitter brutal summer - salt to my blood. Gawd help me, I love this place... physically, desperately, violently. When I die, I hope my ghost-self can wander through these same high aspen groves and wildflowers indefinitely, until space-time collapses, the kaleidescope colors spinning into black. I'm not some dirty hippie, but I nonetheless believe that it's this joy which is bringing so much goodness into my life. I know I have the glow of love - the same which graces newlyweds, and parents holding their newborn child. Call it karma, or just plain luck, but this magical mountain love is coloring my whole experience at the moment. It is deep and abiding, it guides me by unseen force. The first thing that I really and truly knew about myself, as an adult, was that I loved these mountains, needed them to thrive. I was created here, and my very cells are aligned to this place magnetically. And I reek of it, the scent of a mountain-soul. Strangers are forever asking me for directions and advice, you're from here, right? But still, growing up in this place, sporty and active and crunchy, I never really understood my place in it all. I knew that I needed to be outside, but I didn't fit in. All of the outdoor activities seemed so frenetic - find a trail, hike, bike, or ski up it like a maniac (never showing that you are out of breath), stop by a serene lake for a nanosecond to refuel on a granola bar and an apple, then descend. Me, I got caught up taking flower pictures, following animal paths, chasing down the call of birds. Me, dead weight and drag to every expedition. It was only recently, returning to my self and this home, as a wildcrafter, that my relationship to this place evolved and found a comfy groove. Now, instead of identifying as a hiker or even a biker (although I have crazy bike love, don't get me wrong), I see myself as a wanderer, an explorer. Today, my destination is learning, a journey of the senses. I meander slowly, quietly, always connected, always open, no destination in mind. I may only ever cover a mile, but my journey is wholly sensual, aware, in tune. I can feel the life-force of the sun's rays, smell the scent of mushrooms carried upon a breeze, feel the tingle of storms rising, the bone-shaking pitch of thunder. I've come to realize that I am this place. I am the butterscotch scent of ponderosa pine, I am the insects' reproductive fervor, I am the sound of falling snow. And it gives me ultimate respect for this place, for the cycles and circles of it all. So, I'll try to spare you anymore effusive talk of the Rockies. Let me instead try to describe some of my latest and greatest finds. You have to understand that here, where the altitude is high, and the winters are long, summer is a furious thing. Summer explodes like fireworks, each new plants flashing in color, and fading just as fast, completing their life cycle before the frost sets in. It's enough to make any forager's head spin. To a certain extent, you have to choose you battles, balancing learning with collecting. Trying to understand what is worth having, and what is worth simply noting. Right now, this week, today, mondarda fistulosa is in high bloom. 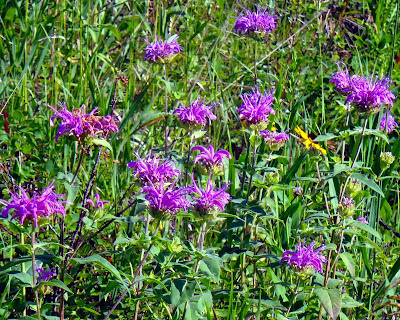 This plant, known by a variety of common names, such as bee balm, is one that I don't want to miss. It has the characteristic square stem of a mint-family plant, and a pom-pom purple flower. It's scent-taste varies from place to place and year to year. Last year, it was boldly minty. This year, it is unmistakably oregano-y. And it has a spicy kick, too, like that of a radish or mustard. Oregano-ker-pow! As you know, it is one of my goals for this growing season to stock my pantry with local spices, which is part of the reason why I have collected such a great quantity of monarda. 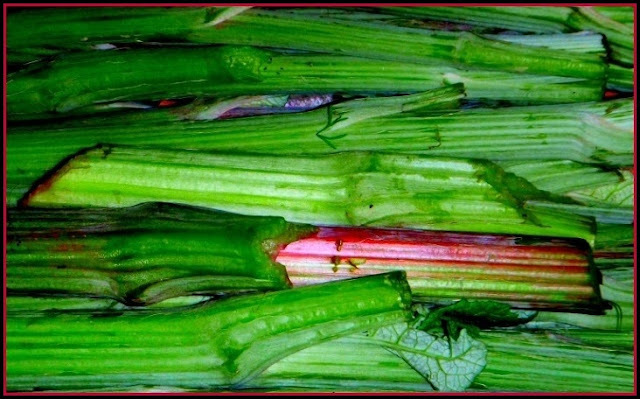 It's flowers, it's leaves, it's stalks can all be used as a premium culinary herb. Take the advise of my friends Rebecca and Kiva Rose, and put the bright purple flower heads of monarda into the finest honey you can get your hands on, then put it into a sunny windowsill for a few weeks. 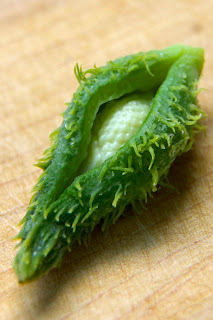 This is both a tasty treat (please please try it on a simple pizza with spicy greens, a ripe cheese, and a salty cured meat), and an incredible medicine. Monarda, either fresh or dried can also be used in all the places that you'd use other oreganos - be guided by the cuisines of Mexico, Greece, and Italy, be creative. Rub it on a roast, tuck it into a casserole, marry it with beans. Or do as I did tonight, and serve it on a pizza with foraged puffball mushrooms and purslane. 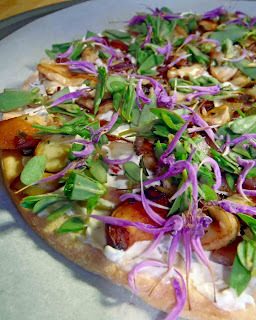 Yes, you heard me correctly - crispy crust, thin schmear of goat cheese, sliced puffball mushrooms, lemony purslane, minced monarda leaves and flowers, a final layer of melty cheese. Who says that foragers don't eat well? Come eat at my house. Revel in the flavors of this place. I'm sharing with Fight Back Friday. This sounds so good! I've used monarda in teas and remedies but never thought of using it as food other than in a salad. You girls put me to shame! Love it! Loved this post. 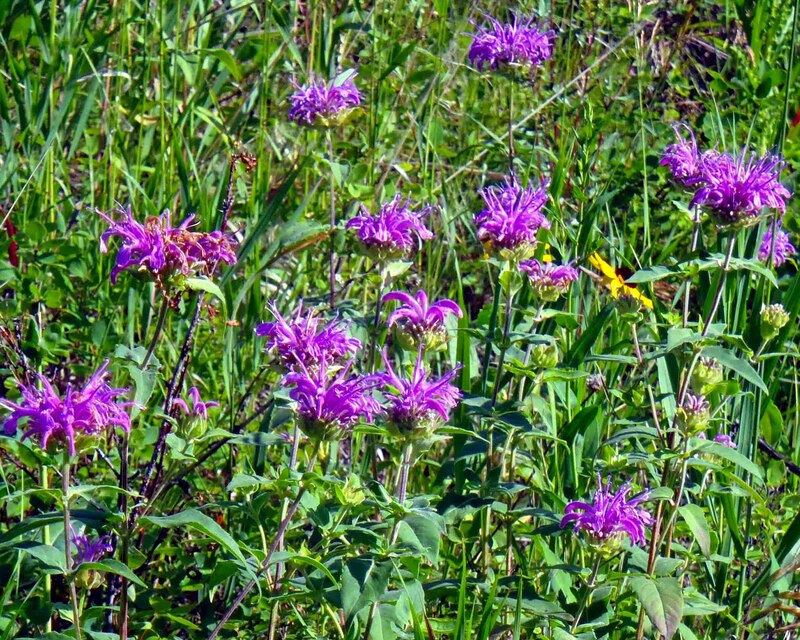 I hadn't realized monarda was tasty; we don't have it wild here, but I do grow some of the native and other varieties in the garden. Big fan of the various monardas. They are minty when I've grown them in the garden, but you are totally right about the oregano/thyme taste when they are in the wild. It is thymol (same active ingredient as in Listerine) and the plant relies on it for defense in the wild. I have some monarda in the forests of Northern Alabama in May and is was super spicy! Are you drying some for winter? Though not born in the mountains, I can relate to your feelings about them. It was the first thing I really knew about myself, too: that this was where I belonged. After many life detours, I'm finally within striking distance of being able to have a bit of land in the Rockies. In the meantime, your life is such an inspiration! Butter, this was such a beautiful post! There's one area in California where monarda grows. I so wish it was more common here!!! Angie - Sometimes I'm just amazed by how strong my physical connection to this place is. Bekka - It's alright, girl, I've got you covered when it comes to monarda. You'd be astounded to see the endless bloom of it this year, and some of the flower heads are nearly as big as my palm. I've never spent time in the Rockies, and I'm moving to western New Mexico in a week! I'm so excited! Looks yummy. I've been experimenting with some very oregano-y lemon balm (tastes more like bee balm to me), and posted a recipe for lemon balm potato salad. How are you settling in C? Love the idea to use it in potato salad. "Yes, you heard me correctly - crispy crust, thin schmear of goat cheese, sliced puffball mushrooms, lemony purslane, minced monarda leaves and flowers, a final layer of melty cheese"
- I think I am in love with you!